, one of the most celebrated painters of antiquity, was born in the isle of Cos, according to Pliny, but Lucian and Strabo assign Ephesus as the place of his birth, and Suidas, Colophon. He flourished in the fourth century B. C. and in the time of Alexander the Great. 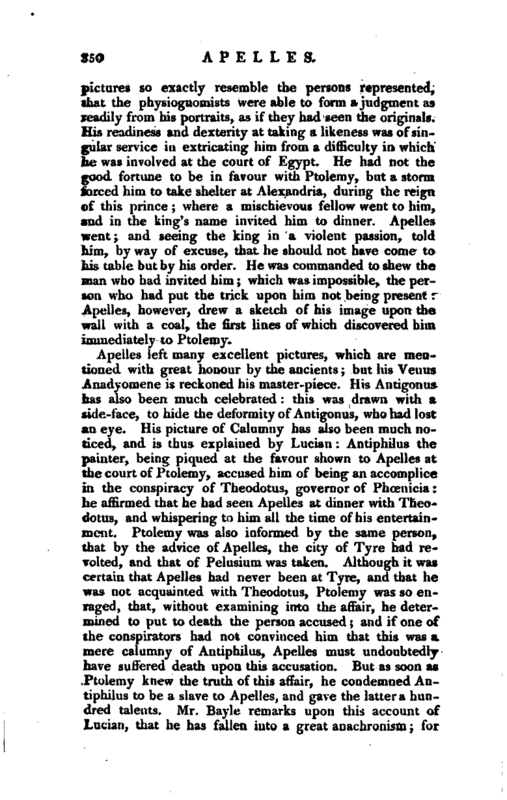 He was in high favour with this prince, who made a law that no other person should draw his picture but Apelles: he accordingly drew him, holding a thunderbolt in his hand, and the piece was finished with so much skill and dexterity, that it used to be said there were two Alexanders; one invincible, the son of Philip, the other inimitable, the production of Apelles. 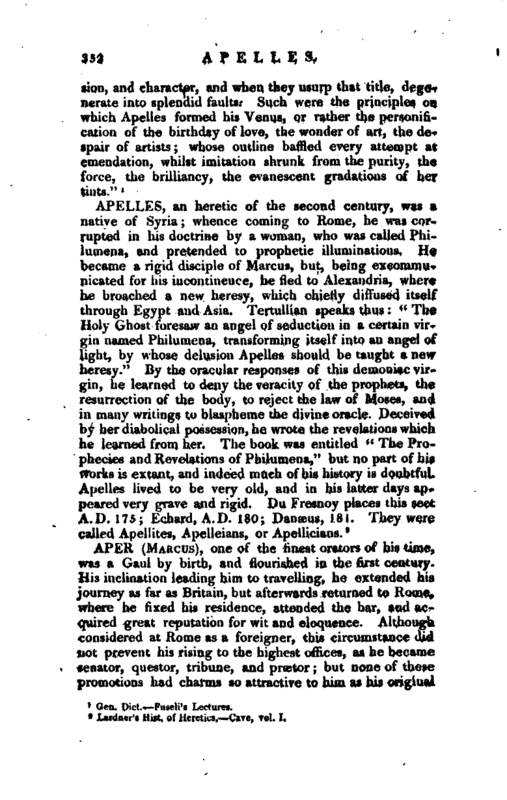 Alexander gave him likewise another remarkable proof of his regard: for when he employed Apelles to draw Campaspe, one of his mistresses, having found that he had conceived an affection for her, he resigned her to him; and it was from her that Apelles is said to have drawn his Venus Anadyomene. This prince went often to see Apelles when at work; and one day, as he was overlooking him, he is said to have talked so absurdly about painting, that Apelles desired him to hold his tongue; telling him that the very boys who mixed the colours laughed at him. 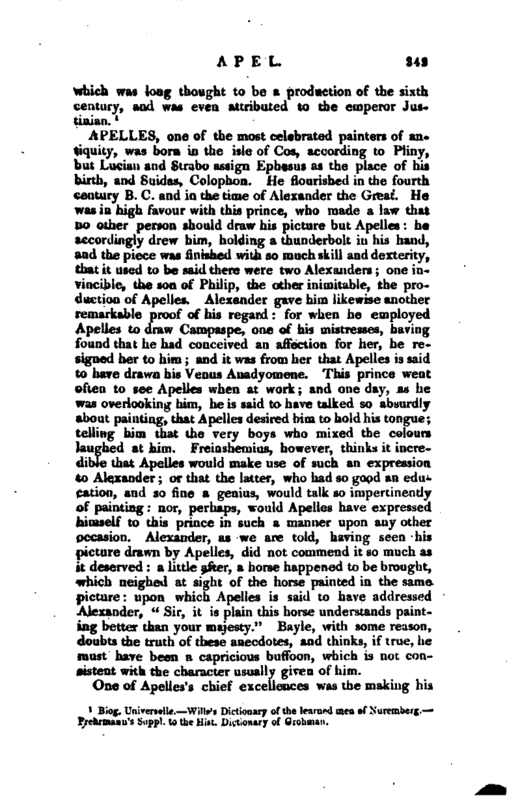 Freinshemius, however, thinks it incredible that Apelles would make use of such an expression to Alexander; or that the latter, who had so good an education, and so fine a genius, would talk so impertinently of painting: nor, perhaps, would Apelles have expressed himself to this prince in such a manner upon any other occasion. Alexander, as we are told, having seen his picture drawn by Apelles, did not commend it so much as it deserved: a little after, a horse happened to be brought, which neighed at sight of the horse painted in the same picture: upon which Apelles is said to have addressed Alexander, “Sir, it is plain this horse understands painting better than your majesty.” Bayle, with some reason, doubts the truth of these anecdotes, and thinks, if true, he must have been a capricious buffoon, which is not consistent with the character usually given of him. One of Apelles’s chief excellences was the making his | pictures so exactly resemble the persons represented^ that the physiognomists were able to form a judgment as readily from his portraits, as if they had seen the originals. His readiness and dexterity at taking a likeness was of singular service in extricating him from a difficulty in which he was involved at the court of Egypt. He had not the good fortune to be in favour with Ptolemy, but a storm forced him to take shelter at Alexandria, during the reign of this prince; where a mischievous fellow went to him, and in the king’s name invited him to dinner. Apelles went; and seeing the king in a violent passion, told him, by way of excuse, that he should not have come to Ins table but by his order. 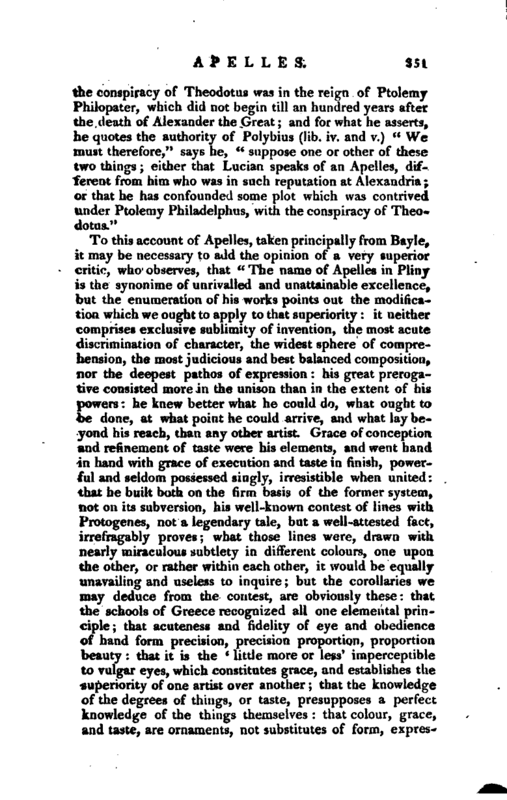 He was commanded to shew the man who had invited him; which was impossible, the person who had put the trick upon him not being present; Apelles, however, drew a sketch of his image upon the wall with a coal, the first lines of which discovered him immediately to Ptolemy.